Oh crikey it’s March already. How did that happen?? Also this post is a little image heavy!! So two of my friends have arrived from Singapore to spend 8 days in Seoul – and like the incredibly organised people they are, they have everywhere they want to go and everything they want to buy all planned out. I wish I had even a tiny amount of their skills because I’d be 326% more productive and motivated. Maybe I should start… make it a March thing…? For their first day, the girls wanted to go to Everland, one of Seouls’ two theme parks, but I’d been told an hour before that that day was a holiday in Korea, and so Everland would be really, really busy. 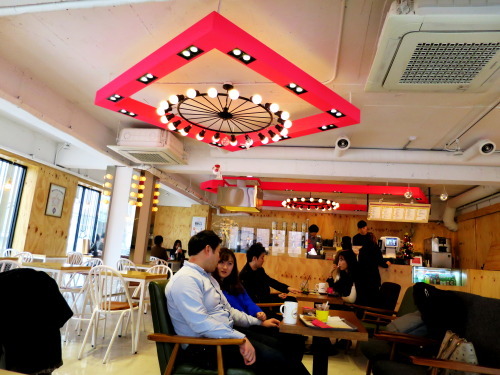 That didn’t sound all to pleasant to any of us, so we decided to get some lunch and go to Garosu-gil in Gangnam. Lunch was kimbap at my favourite kimbap place in Hongdae, Bapuri. 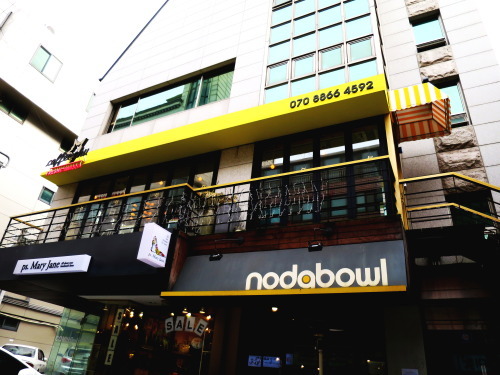 It’s a tiny little restaurant that does amazing kimbap, as well as noodles, salads and snacks. The staff are really friendly and the service is excellent. It’s also cheap, which is a bonus because the servings are huge. Taking the subway to Sinsa-dong is a bit of a chore. It’s only a 20minute ride, but I always, always forget how far you have to walk for the change from line 2 to line 3. 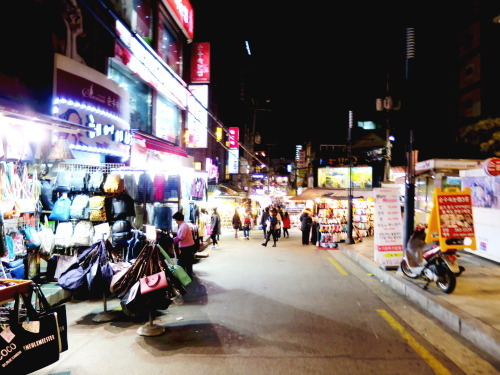 But in Sinsa-dong there is Garosu-gil and the subway is cheap. It was my first time going to Garosu-gil, so I was relying on the girls to know where they wanted to go and what they wanted to do. Thankfully, the set-up of Gangnam isn’t nearly as maze-like as some other places in Seoul, so it was really quite easy to find the shopping street from exit 8 of Sinsa station. Unfortunately the haze Seoul is currently suffering from didn’t make for the best street photos, but hey. We went to coffee chu~ for churros, after debating whether waffles or churros were best for an afternoon snack. Glad we settled on churros because the decor of coffee chu is so cute! 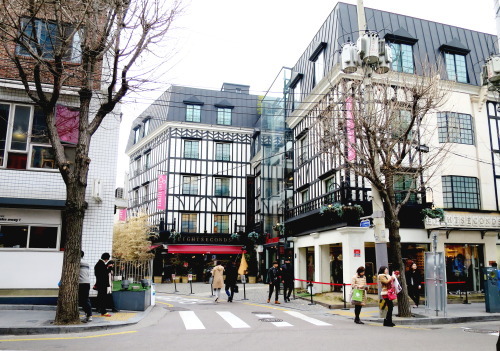 After wandering around Garosu-gil and watching the girls break into their spending money – while being super good and not spending a penny of my own on things other than food and water, we decided to head to the area around Ewha Women’s University, or Edae. We didn’t get very far after leaving Edae station, since a new Artbox store had opened right next to exit 3. Needless to say, Artbox provides enough of everything in ridiculous levels of cute. And I am a sucker for cute. I also really liked the idea of actually being able to organise my polaroids, and Artbox provided the cutest little album for me to do just that. We then went to get dinner, we were all feeling something warm and filling, since the temperature had dipped from earlier on in the day. 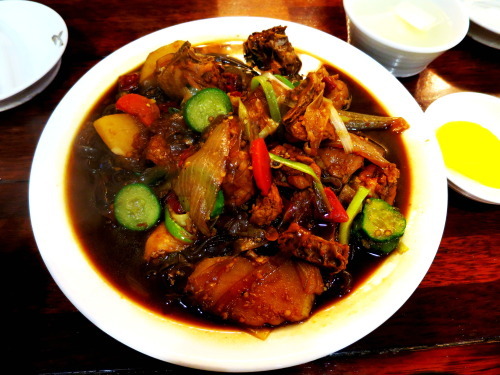 I can’t remember for the life of me what the Korean for this dish was, it was half a chicken with vegetables in a broth and it’s frustrating me that I can’t remember. Argh. It tasted absolutely delicious though. And for 20,000₩ for the amount we got, well. I’ll be going back. Soon, hopefully. We then wandered some more around the Edae markets and shopped. I also took a lot of photos because I absolutely adore cities at night, all that neon and lighting :3. I also ended up adding 10 pairs of 1,000₩ socks and a pair of boots I’ve wanted for ages to my haul. Though two of the pairs I bought for my flatmate because she adores anything with cats on it. I am so in love with those boots. They’re such a dream to wear, and have so much grip on the soles. Thank you slightly-insane-Korean-fashion, for making it thoroughly acceptable to wear heels in snow, and therefore adding traction to the soles of your shoes!! Hmm I have a feeling this week is going to be super busy~ ah well, at least I won’t be bored! !